With it’s rugged design and ease of construction, The Grasshopper was a hugely influential R/C buggy that paved the way for countless other R/C cars. Today it remains a must-have classic for collectors – a gorgeous scale off-roader that still looks amazing, and is one of those pieces of Tamiya history that really defined the brand. 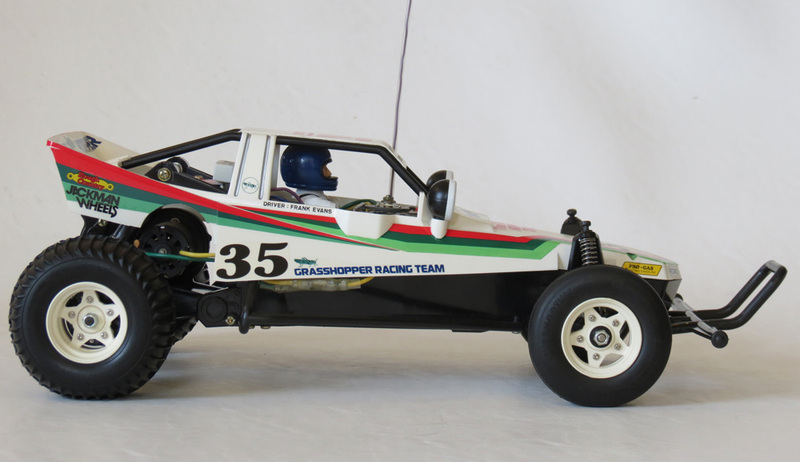 Ask the average person on the street to name some of the R/C cars released by Tamiya during the 1980s, and there’s a very good chance that “The Grasshopper” will be one of the names they remember. It was undoubtedly one of Tamiya’s best-selling buggies of the era. Remarkably, the unusual notion of naming radio controlled buggies after animals (which I also covered in my article about The Hornet) proved to be such an enormous hit for Tamiya that it became something of a defining moment in the brand’s R/C history. 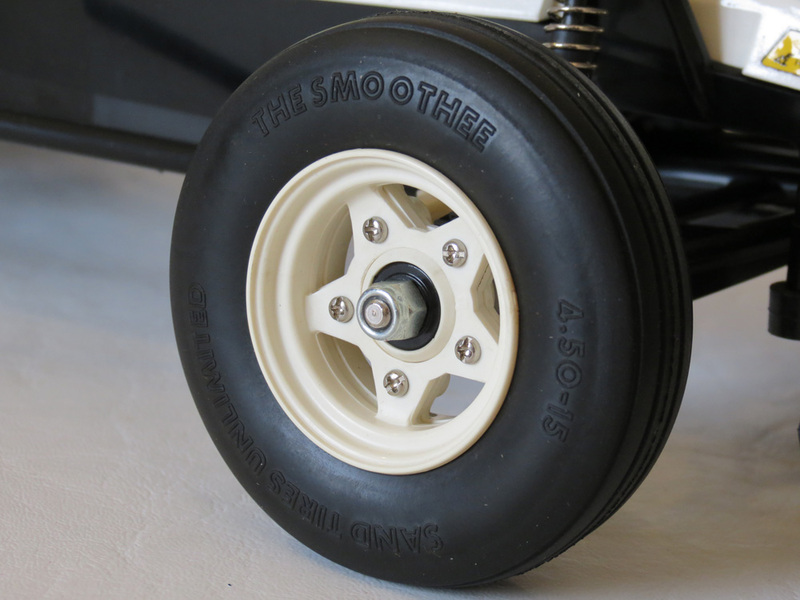 Early Vintage – Notable for the chassis tub having “Off Roader” embossed in it beneath the Tamiya logo near the nose. Also, no hole for a front body mount (something the Grasshopper itself did not need, but which Tamiya added when the Hornet was being released and used the same chassis). It also had: Earlier ‘B’ parts with shallow buttresses on gearbox halves and “RCC Grasshopper” on sprue. Black plastic wheel bearings. Black plastic ball joints. No metal resistor cover. Mechanical speed control with fuse (and no battery connector). Mid Vintage – Difference: Same as Early Vintage, except it had: “Tamiya” written beneath the Tamiya logo near the nose. A hole for the front body mount. White plastic ball joints, mechanical speed control with 6v battery connector and without fuse. Metal resistor cover now included. White plastic wheel bearings. Late Vintage – Difference: Same as Mid-Vintage, except it had: Later ‘B’ Parts with taller buttresses on gearbox halves and “1987 Tamiya” and “RCC Lunch Box” on sprue. 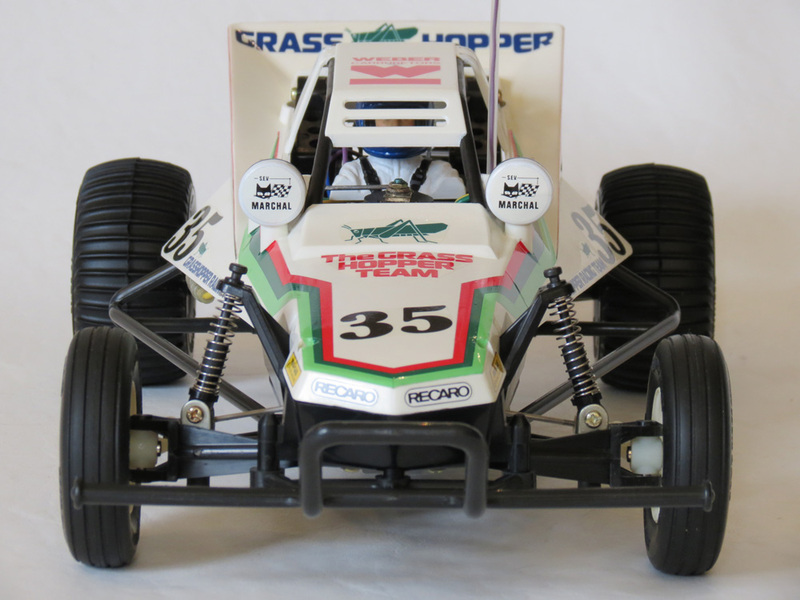 “The Grasshopper”, by Tamiya (2005 Remake). Modern remake with new model number. Contains many changed parts, decals and box. There have also been “XB” (Expert Built), “Candy Green” and “Black” editions – they are all just the 2005 Remake Grasshopper in different colours, either pre-built or in a kit. To this day, the Tamiya brand remains synonymous with the 1980s R/C buggy “craze” in the minds of many people. But in particular, it conjures memories of a range of colourful, unique and character-driven off-road vehicles they released during those fertile years when the hobby was still young. 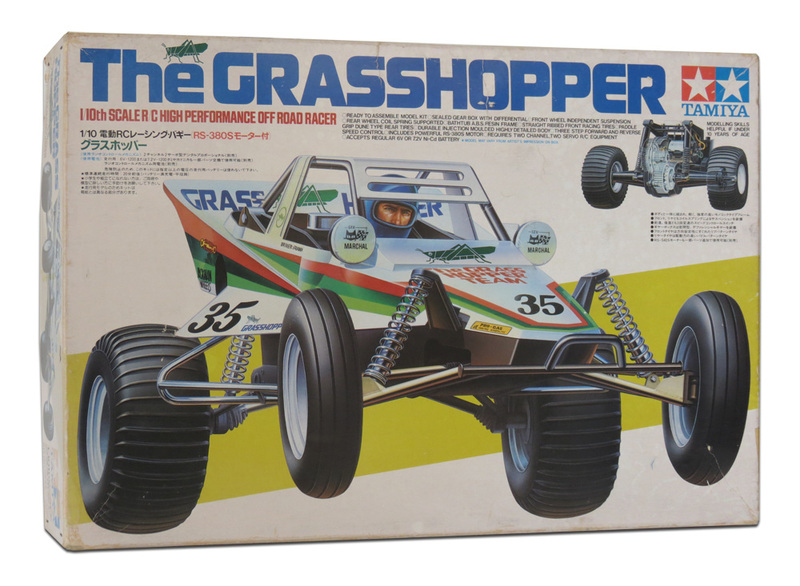 Tamiya’s success with kits like The Grasshopper established them as the dominant brand in the mainstream off-road R/C kit market. And it inspired countless copies from other brands, who viewed the popularity of cars like the Grasshopper and Hornet as an opportunity to create similar R/C toys. As the decades passed and nostalgia for toys of the 1980s grew, this inevitably meant Tamiya even began remaking those past hits, trading on past glories, yet releasing few brand new models that could be said to carry the spirit of what made those originals great in the first place. (One wonders what Tamiya will have left to remake 20 years from now?). That’s not to say Tamiya don’t continue to make quality products. It’s just that the 1980s was such a unique time, when the R/C hobby was new and exciting. Each successive model felt fresh and different. There was still an emphasis on scale model realism, even in buggies. And the real world vehicles the toys were based on also seemed to lend themselves extremely well to miniaturization – with simple, attractive Baja bug and sand rail designs with modest suspension travel, and lots of bright, attractive colours and graphics. Unlike the gangly looking vehicles of today. If you look at the R/C buggies Tamiya have released in the past 15 years or so, many now feel like “by-the-numbers” designs that not only lack realism, but also individuality. Perhaps there’s no new design territory left to explore within the performance demands of modern R/C? Yet even many of the names seem to lack imagination – about 7 new Tamiya buggies in the past decade or so have been called “…Fighter” or “Fighting…”. Tamiya have been phoning-in their buggy ideas for years. Back in 1984, the hobby was young and really taking off. 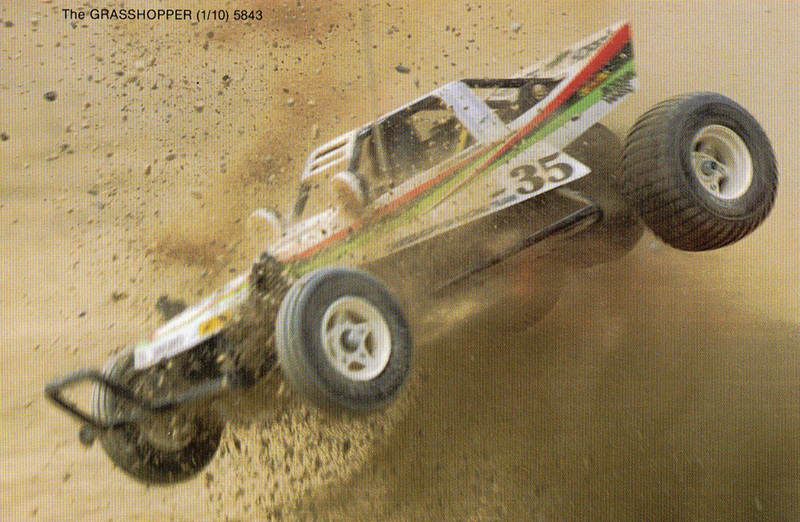 And the Grasshopper not only represented the perfect new product (an easy to build, tough, off-road buggy) at the perfect moment. It was also a perfect synthesis of marketing ideas, and had a nice combination of design, name, and colours that would prove appealing to a wide audience. 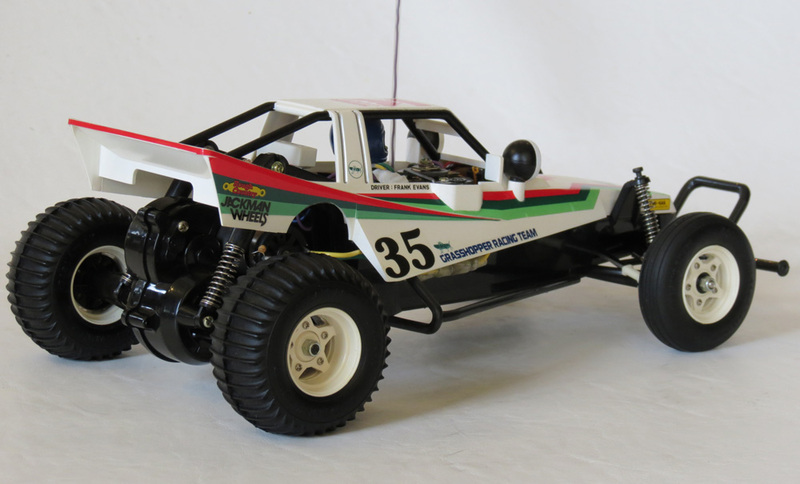 Based on the popular single seat off-road racers seen in events like the Baja 1000, the Grasshopper was a toy that continued Tamiya’s devotion to scale realism as well as being fun and versatile. And with its bright green (grass-like) striping and angular body, there can be no denying that they somehow managed to blend the world of full scale buggy racing, with a sort of familiar ‘natural’ aesthetic. 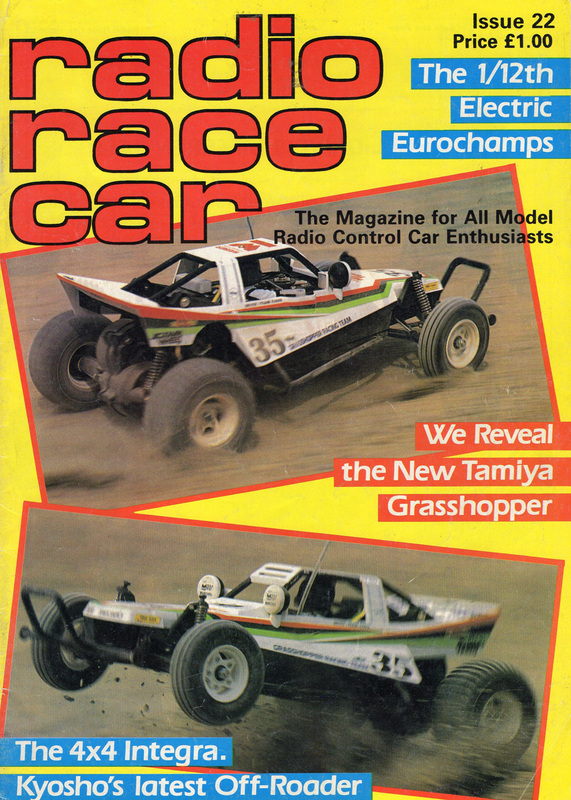 The UK’s Radio Race Car magazine featured the Grasshopper on their cover in this 1984 issue. The overall effect is of something that’s familiar, yet fresh, and that “just looks right” as a scale model toy. You might even say that the car’s relationship to the shape of the animal, echoes how we respond to the things like the Volkswagen Beetle. After all, ‘the Beetle’ was inspired by real beetles – the bonnet and boot resembling folded insect wings. Sometimes a industrial design’s link to the natural world can result in an evergreen shape that human eyes will appreciate for many years. Perhaps at some level, we actually crave seeing the natural in the unnatural. Think about how people often view car headlights as being like “eyes”. And it’s no wonder children were sent into a spin for reasons they could barely understand, falling in love with the idea of Tamiya’s range of buggies with their unique and memorable names and colours. Many of the kids I knew were actually convinced that both the Tamiya Frog and the Tamiya Grasshopper were “better at jumping” than other buggies on the market, and I’ve even heard someone (now in his late 30s) make that same claim to me in only the past year. 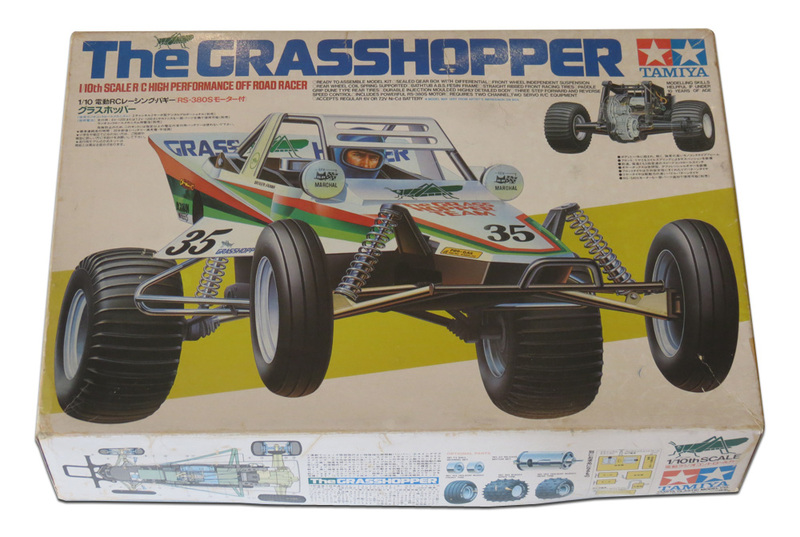 Tamiya’s pioneering box art imagery also played a significant role in the success of their models, and the Grasshopper artwork of course features the car leaping (hopping?) toward you, but in the opposite direction to that of the Tamiya Frog box (which tended to make the boxes look rather great sitting side-by-side on a hobby store shelf!). Inside the kit box, the Grasshopper looks neat and enticing when you first open it up. But as it was intended to be Tamiya’s entry level offering, it’s not too daunting either. There’s just one blister pack of special sealed parts and the rest is comprised of the chassis, body, tyres, smaller packets and parts trees. 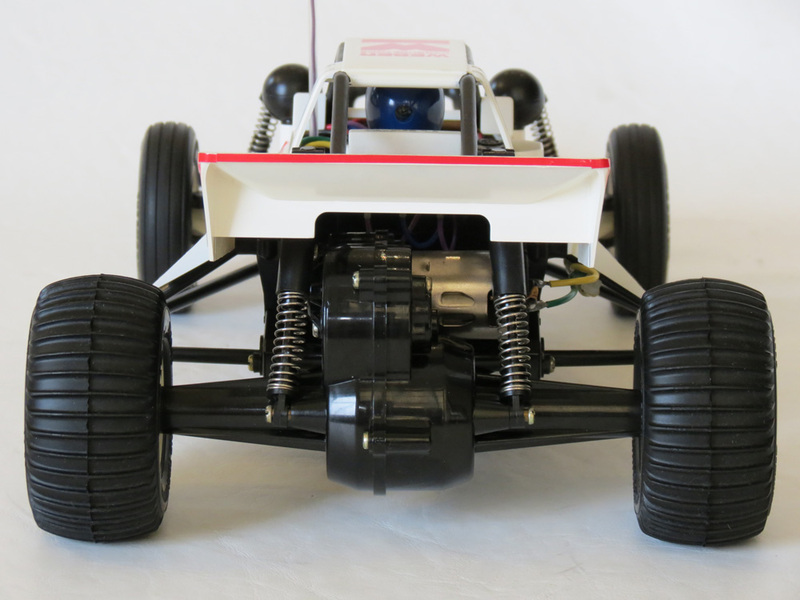 The car is powered by a Mabuchi 380 motor, which is slower than the Mabuchi 540 motor found in most Tamiya models. 380 motors were still popular in kit-based R/C models in the early 1980s for their reasonable speed and longer run times on a single battery charge. 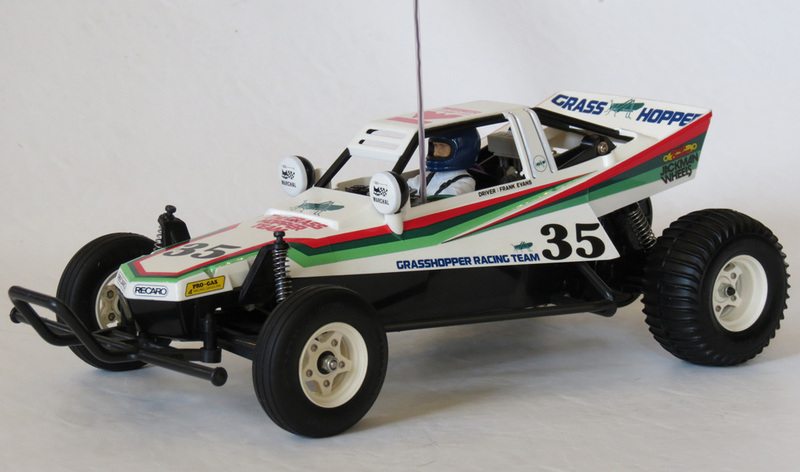 In effect, the Grasshopper filled the vacant slot left in Tamiya’s line-up as they phased out two other 380 motor powered buggies, namely the Sand Rover and Holiday Buggy. The Grasshopper kit also experienced some slight changes during its production run. Initially the kit came standard with a mechanical speed control fitted with a plug that would only connect to the smaller 6volt (5 cell) battery packs. As the 1980s progressed, 7.2 volt (6 cell) batteries became the common type, and I believe later Grasshopper kits began to include mechanical speed controls to suit these batteries. All Grasshoppers have enough space in their battery cavity to hold a 6volt, 7.2volt and even a 7.2volt ‘hump pack’ battery. Above: This is not a 7.2volt battery pack. 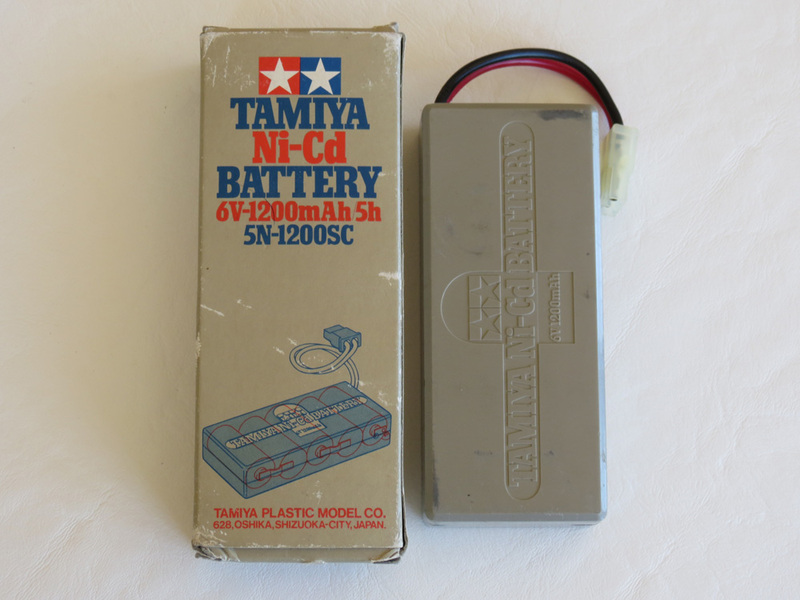 It’s the earlier Tamiya 6volt battery pack. If you were an early owner of a Grasshopper, you may have run it with one of these. Now let’s take a look at a new-built example. As with all my kit builds, this one is finished as per the standards of a fussy collector and die-hard box-art fanatic. Growing up, I knew that if I was ever lucky enough to own some Tamiya kits, I’d be building them exactly as standard spec, as to me this is what they were meant to be. So this one is absolutely original-spec (no upgrades) right down to the screws, the mechanical speed controller, and the black plastic bearings. I built this one from an original kit, and tried to keep it as close as possible to the look of the example featured in the Tamiya catalogue images, in terms of decal placement and driver colour. It even has the 6volt mechanical speed control on board. At the time of it’s release, the Grasshopper’s bathtub type chassis was still a reasonably new configuration on the market. It’s a simple, yet strong design, which also offers easy access to your radio equipment. And when coupled with a sealed rear axle gearbox with differential, independent front suspension, and rolling rigid rear axle suspension – you have an overall configuration that has arguably been the most common R/C buggy design in history. 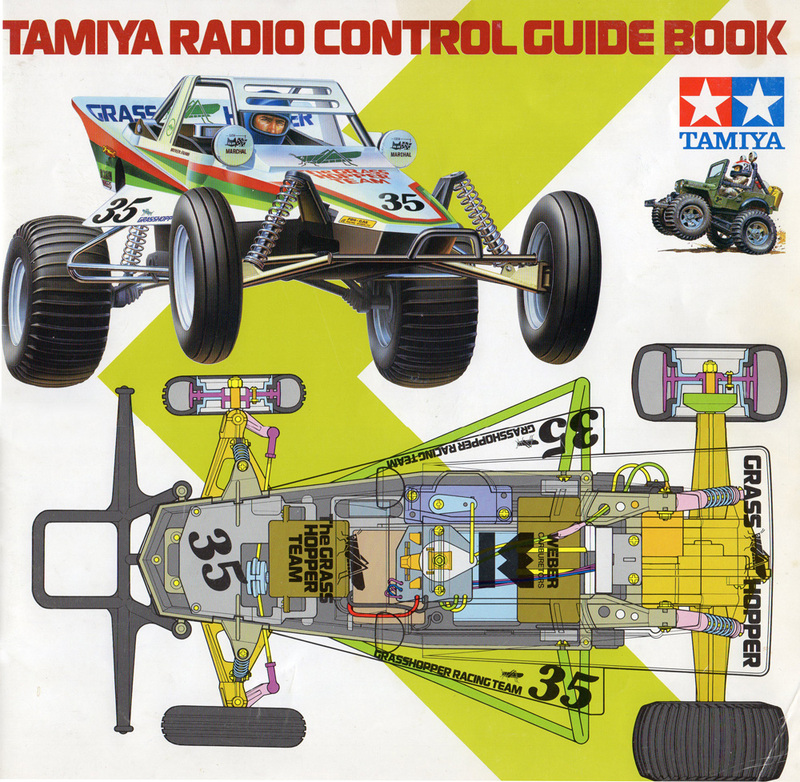 After all, nearly every single ready-to-run 2WD R/C buggy manufactured by brands like Nikko, Taiyo and a myriad of others, was a copy of this basic configuration by Tamiya. And many of them are still following it to this day (over 30 years later). The Grasshopper’s body is an injection molded type, and is pretty tough – but perhaps not as tough as a polycarbonate body during impacts. I have seen a few examples over the years with broken rear wings. Still, it afforded the benefit of more realistic details such as the black rear roll bars, and as with all hard resin body shells it’s very satisfying to paint and do all the little details on it. Just take your time, mask things off carefully, and spray. One unusual aspect of the Grasshopper is the fact that the body affixes to the car with 4 screws, rather than the body pins found on most R/C models. While this does prove to be a hassle when you need to remove the body, it also leaves Grasshopper’s body free of those pins and therefore looking a bit more realistic. 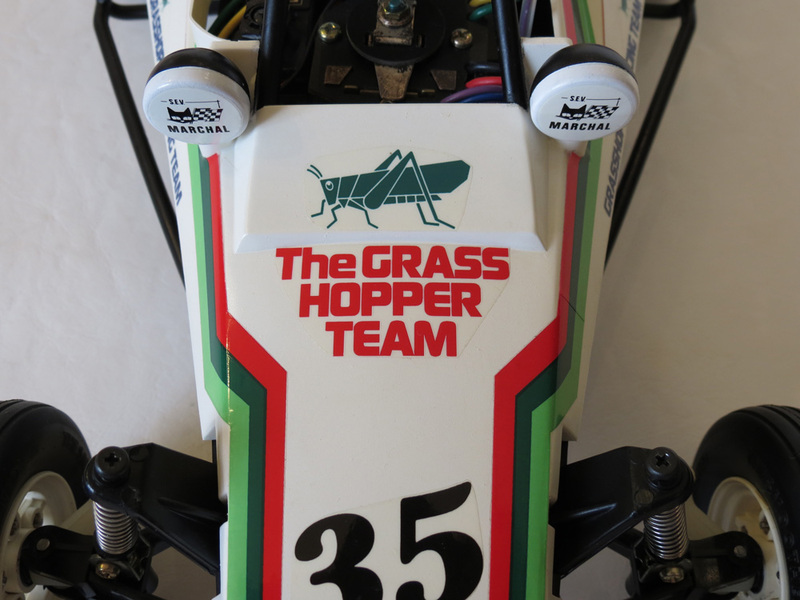 In keeping with Tamiya’s clever marketing, the Grasshopper’s decals are a mix of simple stripes and logos within a limited colour palette. Of course it had to be primarily green on white – but there’s a flourish of red and blue throughout as well. But notice that it barely goes beyond those four colours – and even the box art sticks to the same palette. I think colours can be an integral part of the both the design of an R/C car, but also it’s marketing. The association you get from a car called “The Grasshopper”, which looks a bit Grasshopper-like, uses a limited colour theme with lots of green, plus has a box image that shows it jumping… all played a part in making this product a success. Elsewhere of course, the buggy carries many real world sponsor logos such as Recaro, Weber, Jackman Wheels and others. 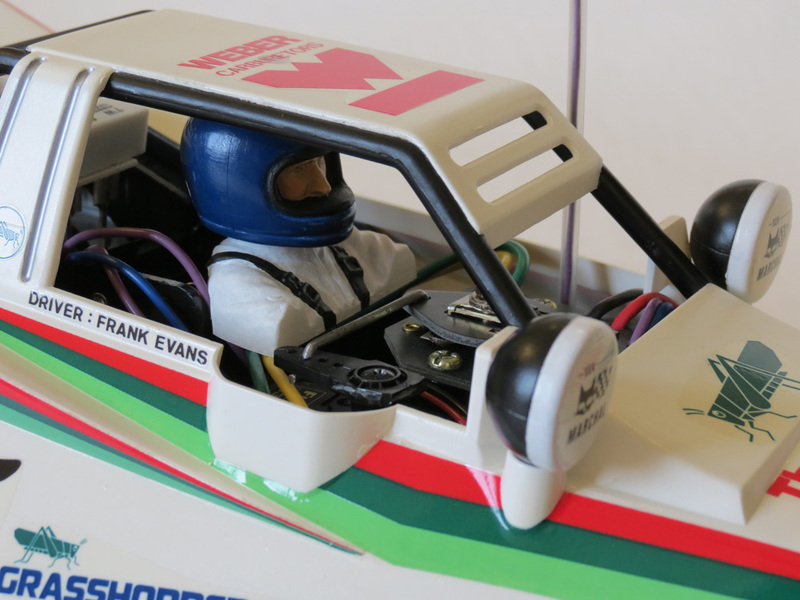 This car was also the third Tamiya model (not directly based on a real-life racing car) to include a driver name decal, with “Frank Evans” on the decal sheet. Was Frank Evans actually a real person? Who knows. 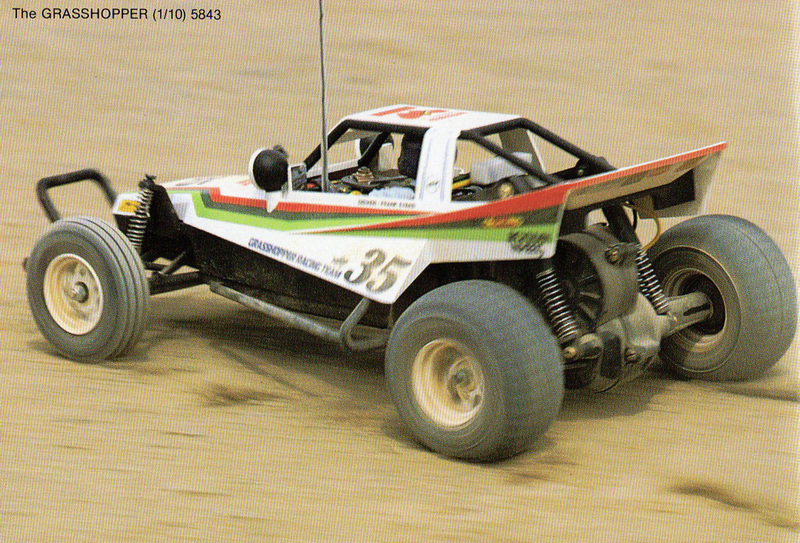 The first Tamiya buggy to have a driver name was the Super Champ with “Al Ernat”, and fans later discovered that the name was that of an employee at a hobby store in California. We also know that company director Shunsaku Tamiya originally visited California in the late 1970s to witness some real life buggy racing, and that this inspired his idea to create a line of electric R/C buggies. Perhaps some of the other driver names that appear on those early buggies were those of real people or drivers as well. In terms of performance, the Grasshopper is actually a pretty great vehicle to drive. Naturally, being a kit-based model that you fit your own radio gear into, you end up with a vehicle that is more responsive and smooth when compared to most ready-to-run R/C toys. But in addition, the use of a 380 motor just makes this car quite a lot easier to drive than many of the faster (540 powered) buggies of the early 1980s. The Grasshopper’s sister model The Hornet, is the easiest point of reference here, as it uses the same chassis as the Grasshopper but has a 540 motor. If you’ve ever driven a Hornet, you’ll know how quick they are in a straight line, but also how tricky they can be as they fish-tail through corners, especially on dusty tracks. By contrast the more modestly-paced Grasshopper is actually quite a pleasure, and it’s still quicker than most ready-to-run type buggies or trucks (certainly those of the early-mid 1980s), which commonly had either 380, 360 or 270 type motors. The Grasshopper was effectively just the next step up from the ready-to-run market in the mid 1980s. Although by the mid-late 1980s there were some ready-to-run options out there such as the Nikko Rhino, Radio Shack Golden Arrow, Radio Shack Red Arrow and Traxxas Cat that were pre-built with 540 motors on board, and inevitably the trend for 1/10 scale buggies was always toward the faster 540-powered cars (case in point, I don’t think any brand has sold a 380-powered 1/10 buggy for the past couple of decades). The Grasshopper features the classic Tamiya 3-piece wheels – each wheel has an inner rim, and two outer rims affixed together with tiny screw and hex nuts. It takes about 10 minutes just to assemble one wheel, but the result of this over-engineering is totally worth the effort as these are some of the prettiest wheels and tyres ever to grace an R/C model. 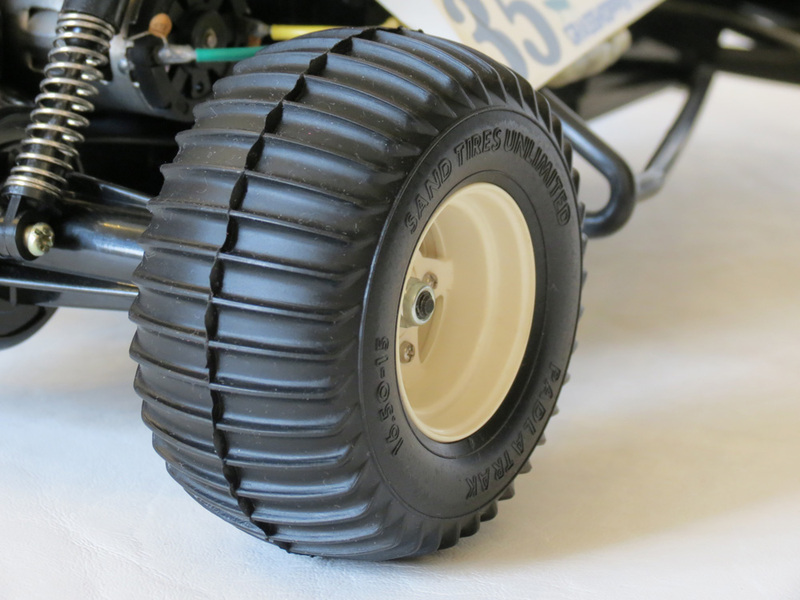 The tyres on the Grasshopper are identical to those used on the famous Tamiya Sand Scorcher off road beetle – “The Smoothie” tyres on the front, and “Padlatrak” paddle tyres at the rear. Incidentally, these are also real tyre types that exist in full scale for real off road cars. In 2005, the Grasshopper kit underwent a remake. The new kit has a new model number (58346). It is therefore a new model in Tamiya’s history. It differs from the original in many ways. Tamiya’s remake kits can be easily spotted by collectors, due to new box art/graphics, inner packaging, and loads of actual parts changes – as well as different decals and a different build manual. They are also not always made in Japan, unlike the originals. For a general overview about this, please visit: “A quick guide to vintage vs remake Tamiya R/C kits”. As always with remakes – they offer a cheaper way to build and play with a car that looks vintage. However if you want something that actually is vintage, and to relive what it was like to build or drive the original car, there is no substitute for buying an original with all it’s quirks and charms. An essential buggy for collectors of vintage R/C, the Grasshopper holds the distinction of being both many people’s first foray into kit-based R/C fun in the 1980s, and quite an influential car in the sense that it’s basic design proved so robust that it was reworked and copied so many times, both by Tamiya and by other R/C makers. The Taiyo Jet Hopper owes a particular debt to the Grasshopper, both for it’s looks and it’s name. 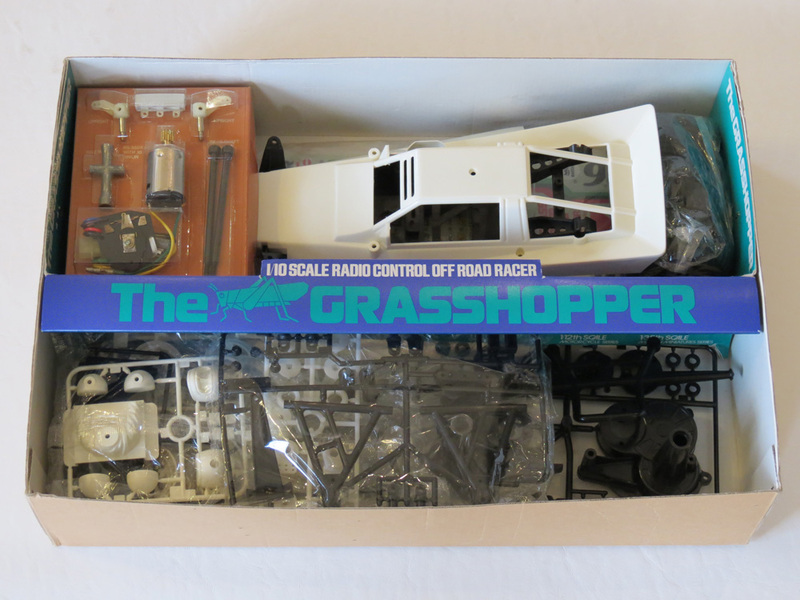 The humble Grasshopper may have been the minnow of Tamiya’s R/C lineup in terms of straight-line speed, from 1984 until it was discontinued in the late 1980s. 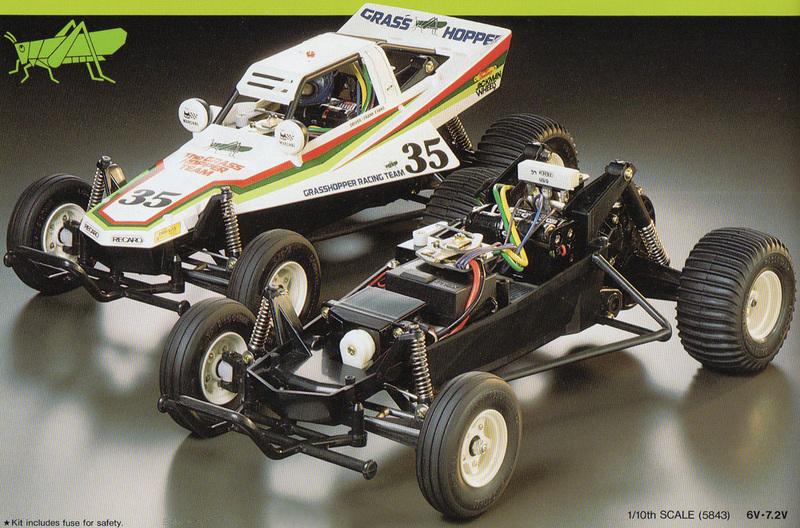 But it’s a beautiful hard-bodied scale model buggy that is now one of the all-time legends in Tamiya’s history. I tend to think of the Frog, Hornet and Grasshopper as being the most essential cornerstone trio of all vintage Tamiya buggies, as they truly were the cars that made the brand so ubiquitous in R/C. And they were certainly the first Tamiyas I can remember wanting as a kid, as I wore out the pages of my old catalogues by flipping through them constantly, comparing and contrasting the features. Batteries: 1 x 7.2volt OR 1 x 6volt. Optional 4 x AA (Car). Transmitter purchased separately. Overall, the Grasshopper is quite a robust buggy, and only severely mistreated examples will have major breakages or problems. You should also check carefully to see whether the one you’re buying is an original or remake. Nice analyse of the Myth. 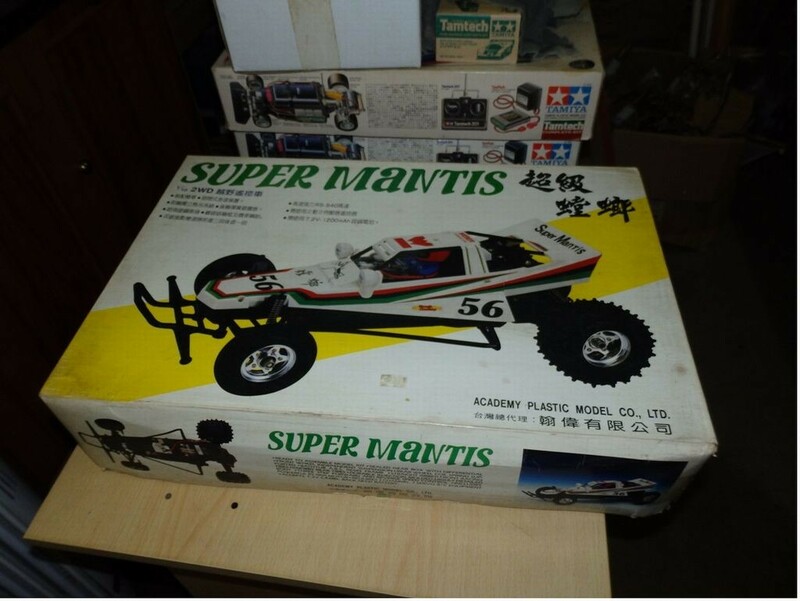 Many beginners started into rc hobbies with this car. Like Steeve Austin it is “better, faster, stronger” with a 540 silver can. In 2014, we celebrated his 30 years during a French Vintage Event, with a race dedicated to this buggy. A lot of fun ! Some great photos there from France, thanks for sharing David! Yes, some of the original kits do have those shrink tubes. You splice two wires together, put a shrink tube over the join, and then use a hair dryer to shrink it down to hold the splice. I always found this fun, and it actually works pretty well too 🙂 Thanks for the kind words Rob. Thanks for the side by side comparison of the chassis! Now I can check, if my Grasshopper (which I bought cheaply online), is a real vintage one. Congratulations on an excellent blog! I found you whilst researching if Grasshoppers and Hornets were still available to buy. I hadn’t seen the name Tamiya for a quite some time, and all the R/C cars I tend to see these days seem to be Traxxis, so wasn’t even sure if the company still existed! I too wanted a Tamiya in the 80’s, but my mum couldn’t afford it. A mate managed to get, from what I remember (and looking at your images), a Turbo Hopper, and we had a blast running that thing off jumps etc in his back yard. The one thing I do remember was that this car used to go alright on grass, and my question to you is, would a grasshopper or hornet be okay over grass? I only ask as I’ve seen others say they wont. Cheers, and keep up the good work! Thanks Jay! Great memories there, thanks for sharing. As for running on grass – it really depends. Really low grass (like the putting area of a golf course) is ok. But anything taller than that does cause issues – the cars will blast along, but they have to work a bit harder – particularly in taller grass. I used to run some of my Tamiyas on grass quite often, but only when it was mowed really low. If you own an original Tamiya – with original mechanical speed control and resistor unit – always be aware that running on grass where the car is being held-up too much can also cause things to overheat (motor and resistor). In short – really low grass is ok. Medium/long grass, don’t do it. Ideally these vintage buggies are best suited to hard packed dirt surfaces 🙂 (but you also have to clean them more often). I remember buying a Grasshopper and making it myself. The first one I ever made. I liked the model but was disappointed that it didn’t have a 540 type motor like most other kits like the Hornet. I think they called it “sports tuned” but was more like a 380 motor and was much slower. Ended up buying a Technigold motor for it and made it fly. Hi Arthur – it sounds to me like your buggy is more likely to be a Hornet. Though which Hornet (original or Super Hornet) is up for debate also. If you can upload a picture of it somewhere (e.g. http://www.imgur.com), and post the link here, I should be able to tell you.